U.S. Congressman Chris Gibson is introduced by Birchez Associate’s Steve Aaron at a press conference by Gibson introducing legislation that would re-authorize the Older American Act (OAA). Congressman Gibson says he chose the site because the Birchez Senior communities are a great example of how to care for our nation’s senior citizens by offering high quality, affordable housing that truly meets the needs of the areas senior population. More than 400 senior citizens packed the dance floor at the Dutchess County Division of Aging Services’ 17th annual “Dutchess County Senior Prom”. Seems like there are fewer parades these days for returning Veterans. Veterans return home to rising prices and fewer jobs. At least some affordable housing communities, in association with NYS agency Homes & Community Renewal, try to recognize the sacrifices made by our armed services in creating Veteran preferences. 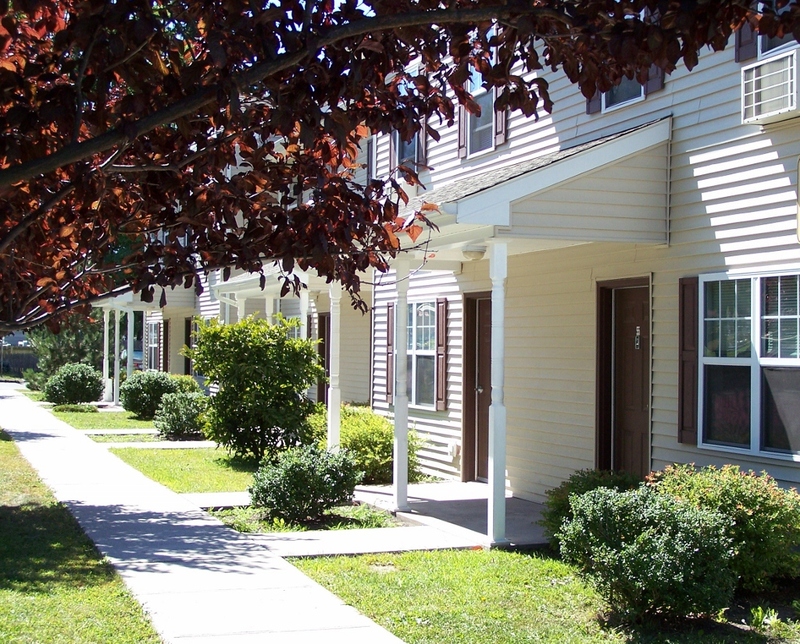 “The very least Vets deserve is clean, safe and affordable housing,” said Patrice Steigler, full-time property manager at Birchwood Village in Kingston, NY. Steigler explained that a Presidents’ Day Open House was a perfect vehicle for letting vets know that affordable housing does exist. New York State is particularly challenged in that it has one of the highest Veteran populations per capita, and the Hudson Valley houses half that number. Birchwood Village is designed for working families, the economy’s backbone. Earning less than the area’s median income, these families generally find housing costs eating up so much of their budget that other basic expenses, like food and health care suffer. 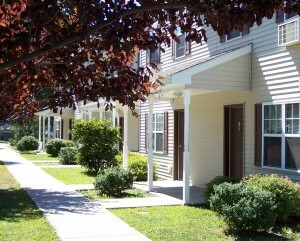 With rents set by NYS each year, Birchwood Village includes heat and hot water for the 2- and 3-bedroom apartments, so a family can make ends meet. Steigler said the complex also offers a limited number of “flats,” handicapped accessible units. “We truly create a community here, with 80 apartments and amenities, a great location, and bus service right in front,” she said. If you are unable to attend the open house, just call 845-331-8232 to make an appointment for your own tour and application information. One day, most of us are likely to have an elderly family member who needs round-the-clock care. Putting a transition plan in place now can save you significant money, time and headaches down the road. Medicaid, the state-federal health care program for the poor, pays for about half of all nursing home care in the U.S. This column will focus on qualifying for Medicaid while protecting your assets. A future column will look at other options, such as long-term care insurance. 1) What can I keep? When someone goes into a nursing home, he or she can retain up to $13,800 in assets. Any spouse or dependent, if still living independently, is entitled to keep his or her house and a car. On top of that, the so-called “community spouse” can also hold onto at least $21,912 and up to $109,560 of the couple’s joint assets. All of these figures increase with inflation each year and vary by state. You can also use some assets to purchase a prepaid funeral plan. 2) What might I lose? Besides that house, car, funeral plan and sum of cash, everything else a couple owns is fair game to pay for nursing home care, which costs a median of $115,000 annually in New York state and $62,000 in Alabama. When you apply for Medicaid, the state looks back at your financial records for five years to establish that you have no further money to pay for care out of pocket. If you put the title of your home in a child’s name or transfer money into a grandchild’s college fund during that five-year look-back period, the government is entitled to take those assets. They will even take the payoff on a life insurance policy. So if you have any reason to believe that someone in your family might need care within five years, now is the best time to hire an eldercare attorney and look into setting up a Medicaid trust or other transfer of assets to try to preserve your inheritance. 3) What’s the application process like? Most states maintain websites that give you an overview of the process. In brief, you need your Social Security number, tax returns to prove income from federal benefits or private pensions, information on your assets such as bank accounts and insurance policies, a marriage certificate (if any), proof of address such as a mortgage statement or piece of mail, and insurance and Medicare benefit cards. Once your relative is approved for Medicaid and safely placed in care, it’s time to turn your attention to the community spouse or dependent. Be cautious and always consult a professional who is familiar with the laws in your particular state before attempting any steps to shield assets from Medicaid, be it a trust, a transfer or a gift. 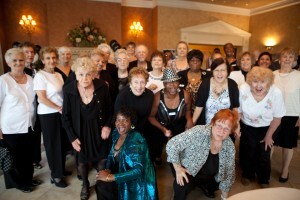 Thanks to the generosity of community supporters, Kingston NY area seniors danced the night away waiting for the 2012 ball to drop. 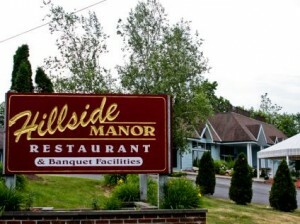 The annual New Year’s Eve event was held at The Hillside Manor , a leading fine dining and events facility. Host Denni Demosthenes managed to get all guests to the table despite the many attendees who arrived up to an hour early! Over 350 seniors attended and enjoyed a full dinner and dessert, dancing to both live and DJ’d music, a champagne toast and, of course, New Year’s hats and noisemakers. The music makers mixed it up with the predictable old favorites and many contemporary hits that got everyone on the floor rocking. For the third year, the main sponsors were Birchez Associates, the Bruderhof, and the Demonthenes family which owns The Hillside Manor. Other local purveyors also helped out. For example, Adams Fair Acres Farms donated beautifully prepared (and delicious) cookie platters for each table, Deisings Bakery provided the dinner rolls. The smiles of the seniors were evident at the festively set tables in both the full rear ballroom and the restaurants front function room. Not to be outdone by the decor, many of the ladies were “dressed to the nines.” As one quipped, “Where else am I going to get the opportunity to get so dressed up. I love it!” Join the festivities via video (only a minute and a half in length) in which Birchez principals Steve and Judy Aaron welcome one and all. Several political leaders stopped by to lend their support, most notably Congressman Maurice Hinchey who greeted many by name. Outgoing legislator Walter Frey and encumbent councilman Jimmy Bruno traveled from Saugerties. Majority Leader for the Kingston Common Council Tom Hoffay was in early attendance. Newly elected Alderperson Deb Brown, 9th ward Kingston, shared her thoughts on the video. Seniors who attended and who would like to comment on the evening can contact us at birchezassociates@gmail.com. We’d love to share your thoughts as we enter 2012! Holidays can be lonely for seniors living on their own. But at the Birchez Associates communities, you’ll find many ways to celebrate the holidays. In addition to cosponsoring the Kingston area senior New Year’s Eve party (to watch video, click here), Birchez owners Steve and Judy Aaron also hosted a holiday party for all their senior residents and staff. At The Hillside Manor, a popular dining and events destination in Kingston, Birchez took over . 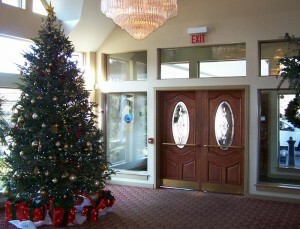 A decorated Christmas tree welcomed guests in the foyer, with holiday decoration throughout. Cocktails and hors d’oeuvres started the event in the front ballroom. Then festivities moved to the full back ballroom (complete with its own Christmas tree and Menorah) for dinner and dancing. 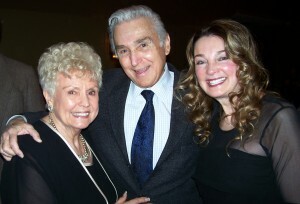 Special guests included Congressman Maurice Hinchey who spun at least one senior on the dancefloor. County Treasurer Eliott Auerbach and his lovely wife Judy, County Clerk Nina Postupak, County Legislators Peter Loughran, Hector Rodriguez and Walter Frey, as well as Town of Esopus Council members Kyle Barnett, Gloria VanVliet and Donna McAuley also joined the party. The band leader of “Outside the Box” thought he was doing the right thing when he mentioned a 92 year old resident was on the dance floor, only to have other dancers raise their hands to say “I’m in my nineties too!” From the salad course through desert, the dance floor was in motion. Whether a classic melody or a cover of a contemporary song from Lady GaGa or Adele, guests were up and dancing. Chambers Court Resident and Centenarian Bill McDonough didn’t dance but had a front row table to watch others do so. 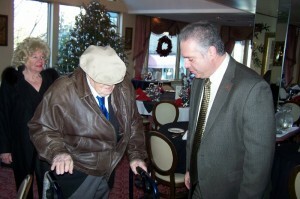 Host Steve Aaron (right) greets Centennarian Bill McDonough as Chambers Court Resident Dorothea Schwenk looks on. Pointsetta centerpieces obtained through the local Boys & Girls Club were given to those residents who found a lucky penny underneath their place setting. In addition to peach melba for desert, plates of cookies from local Deising’s Bakery provided some extra energy for seniors to keep the dance floor full. And for residents who no longer drive, A.N.N. Transportation provided a handicapped bus and van to get everyone to the event. After four hours of partying, there was even some grumbling when the announcement was made that the bus and van were ready for loading to take residents home. “Already?” some were heard to exclaim! November 28, 2011 – As Baby Boomers take center stage, much is written on their spending patterns, use of technology, travel ideas, and more. But one of the most encouraging and inspiring takes comes from stylist Ari Seth Cohen in his blog Advanced Style, which proffers “Proof from the wise and silver haired set that personal style advances with age”. Ari’s subjects, male and female, are over 50 — and fabulous! He certainly demonstrates that age is no barrier to style. To the right, meet Rose, age 100, as she poses for Ari’s blog. 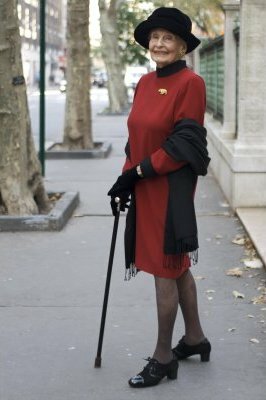 Ari’s book, Advanced Style, is on pre-order with Amazon with an April 2012 publication date (that’s a shame because I would have loved to gift it this holiday season). 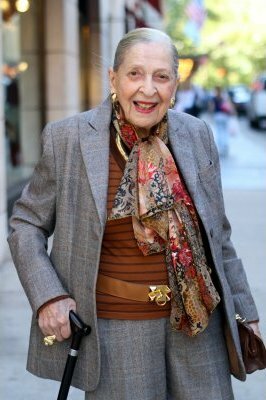 As with his blog, the book promises insights from his subjects, an interview with a 91 year old subject, and delicious photos (many apparently candid, on-the-streets of New York photos). Meanwhile, Ari’s blog also offers videos and enchanting tidbits on matching vintage items, and playing with different costumes and styles. Hats are plentiful and I predict an influx of designer canes! I’ve seen many of our senior residents at the Birches communities, where the average age is in the 70s, styled and ready for their close up. Whether they are dressed for the fitness studio, the movie theater, or on their way out the door, many show great flair. The old perception that the elderly dressed in dusters and wasted away their waning years in front of the TV just doesn’t play with today’s seniors. Fair warning, we’ll be featuring some of our own Stylin’ Seniors in future blogs. Another of Ari’s elegant subjects is Ruth, shown to the left, who is also 100 years old. This Thursday, November 10, 2011, at 8:35am*, My Kingston Community Radio (myKCR.org, 920 am also known as WGHQ) once again shares the mike with K.J. McIntyre, Director of Marketing for Birchez Associates, for Senior Spotlight of the Month. This month’s spotlight is on Jewish Family Services of Ulster County and will feature Sharon Murray-Cohen, LMSW. Sharon, who is the JFS Executive Director, will speak about the services offered to seniors and their caregivers. One often mistaken notion is that you have to be Jewish to utilize Jewish Family Services. Far from it; somewhere around one in ten clients of JFS is Jewish. JFS, in addition to programs provided by staff and licensed social workers, also has a volunteer program to assist seniors. Whether it’s just a call of reassurance, or accompanying a senior to the doctor’s office or shopping, these activities done by volunteers can make a huge difference in a senior’s quality of life. On Thursday during the live broadcast, you can call in to ask Sharon questions at 845-331-9255. *If you miss the half-hour broadcast you can hear it online. Just go to mykcr.org, click on program archives, and fast forward about 2/3rds through the recording. Town of Ulster, August 22, 2011 Wendy K. Rudder, LCSW and Care Consultant for the Alzheimer’s Association presented the basics of the disease to some fifty senior residents of The Birches at Chambers and Chambers Court who gathered today in the Community Room at The Birches at Chambers. This is the latest affordable senior community developed and managed by Birchez Associates. Ms. Rudder had been invited to speak through the efforts of Senior Advocate for Birches Associates, Alice Tipp. Alzheimer’s Disease is an irreversible, progressive brain disorder that affects memory, behavior, personality and muscle control. And the numbers are startling: While Alzheimer’s generally affects people 65 or older, a quarter of a million under 65 have the disease. Over the age of 65, one out of eight people has the disease. The likelihood of developing the disease doubles every five years after age 65 so that 49% of those 85 and over have Alzheimer’s — nearly one in two people. Already more than 5 million Americans live with Alzheimer’s and yet the Baby Boomers are just crossing the age 65 threshold. It is estimated that without a cure, Alzheimer’s will move up from the #7 cause of death among adults to number one by the middle of this century. Wendy suggested that the above symptoms may merit a visit to a neurologist. And she stressed that one or two of the symptoms by themselves may not mean an Alzheimer’s diagnosis. Sometimes the combination of medications, or the body’s inability to absorb B12 is enough to mimic these symptoms. The Alzheimer’s Association can help in many ways including education, referrals and caregiver groups. 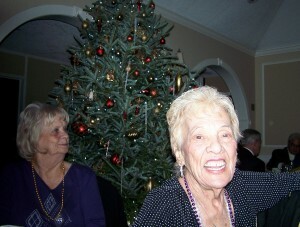 Their helpline and website is www.alz.org. The Hudson Valley/Rockland/Westchester, NY Chapter is housed in Poughkeepsie. If you are calling from Ulster County, use 845-340-8474. The Walk to End Alzheimer’s raises funds for global research and to provide support services locally. In this area the Walks to End Alzheimer’s will be Saturday, October 15th in Poughkeepsie and Saturday, October 22nd in Stone Ridge. To sign up, www.alz.org/hudsonvalley or call 1.800.272.3900. August 22, 2011, Town of Ulster: It’s not easy surprising Alice Tipp, the Senior Advocate for Birchez Associates, but the Birchez staff and the residents of The Birches at Chambers and Chambers Court managed to do just that. Today it was Alice Tipp Appreciation Day! Alice has plenty of experience showing up and being on time having served thirty years in the Ulster County Legislature before accepting her position as Senior Advocate. Alice’s experience is invaluable as she matches resources to the needs of the residents in the four Birchez communities she services. Appreciation was apparent in the applause, warmth and laughter expressed in the room of fifty or so. Among the attendees were several surprise guests including her son Tippy (Walter Scott Tipp II), her daughter Cheryl and son-in-law James McTague. 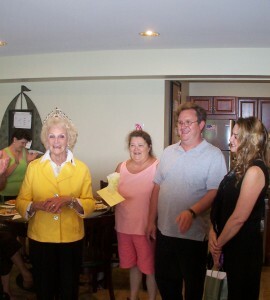 Steve and Judy Aaron presented Alice with a pearl necklace, and the staff gave her a basket of goodies and flowers. Ice cream cakes and pound cake rounded out her luncheon. Alice even read the sentiments of the many cards aloud and admired the stealth with which her friends had operated to pull off her surprise party. 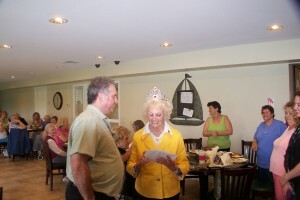 The crown from Senior Property Manager Judy Fitzpatrick was just the right touch for a lady who deserves to be queen every day. © 2016 Birchez Associates LLC. All Rights Reserved.